"There is a huge population out there living with dementia who don't know about it," says Halima Amjad, MD, MPH, an assistant professor of medicine at the Johns Hopkins University School of Medicine and the study's lead author. "The implications are potentially profound for health care planning and delivery, patient-physician communication, and much more," she says. An estimated 5.7 million people in the United States live with dementia, according to the Alzheimer's Association, but only one-half of those have a documented, official diagnosis by a physician. Timely diagnosis is important for maintaining or improving health and planning care, Amjad says, so it's important to identify which populations are less likely to be diagnosed or less likely to be aware of their diagnosis. The research team identified 585 such adults and examined demographic data such as highest level of education attained, race/ethnicity, and income, as well as data on whether participants were able to perform activities such as laundry, shopping, or cooking on their own. Among those with probable dementia, 58.7% were determined to be either undiagnosed (39.5%) or unaware of their diagnosis (19.2%). Participants who were Hispanic, had less than a high school education, attended medical visits alone, or were deemed more able to perform daily tasks were more likely to be undiagnosed. 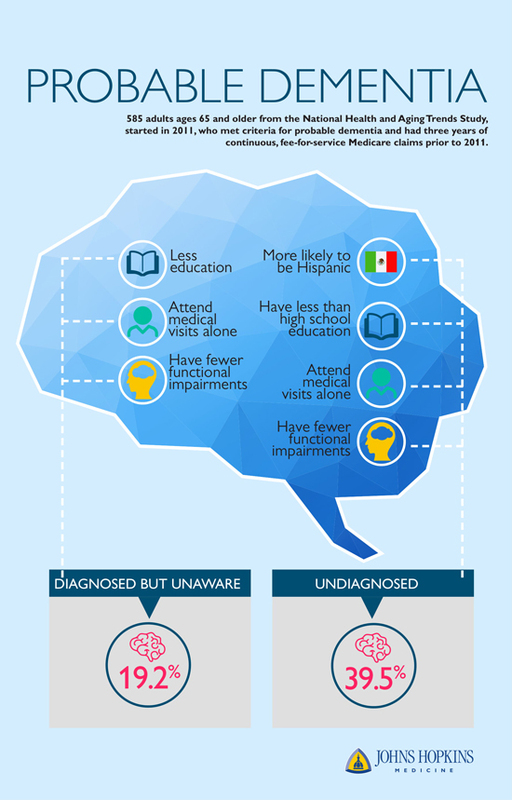 Specifically, those with at least a high school education had a 46% lower chance of being undiagnosed compared with those who had less education, and those who attended medical visits alone were twice as likely to be undiagnosed than those who were accompanied. Participants who were diagnosed but unaware of their diagnosis had less education, attended visits alone more often, and had fewer functional impairments. Those with at least a high school education had a 58% lower chance of being unaware compared with those who had less education. Those who attended medical visits alone were about twice as likely to be unaware than those who were accompanied. Each activity impairment decreased the chance of being unaware of diagnosis by 28%. "There are subsets of people doctors can focus on when implementing cognitive screening, such as minorities, those with lower levels of education, and those who come in by themselves," Amjad says.